As a professional Scottish salmon fishing guide it's amazing who you can meet on the riverbanks of Scotland. This fine shot which was taken last year in the beautiful Glen Tilt is of the brilliant and original Batman actor Michael Keaton. Scotland is renowned for it various high profile and globally recognised salmon rivers which attract thousands of salmon anglers each year. Other well known visitors I've had the pleasure of fishing with in recent years include her Royal Highness the Princess of Dubai, Douglas Daft the CEO of Coca Cola, Dave Cote the Ceo of Honeywell, the former Scotland manager Walter Smith and the former Liverpool boss Graeme Souness. All these people were attracted to the Scottish salmon rivers based on their beatuty, reputation and healthy Atlantic salmon runs. For those of us who understand the game we are involved in and the natural cycles of this amazing game fish you'll realise that the unpredictability of the sport is much to do with the actual allure of trying to catch a wild Atlantic salmon. Natural stock cycles exist in nature with naturally ocurring peaks and troughs. In salmon fishing there are no guarantees and I hope there never are as a salmon river knows how to separate 'the men from the boys' and encourage the 'boys' to lift their game. You simply cannot just turn up on any salmon river anywhere and expect the same instant gratification you'll find in a stocked trout fishery or society in general for that matter. 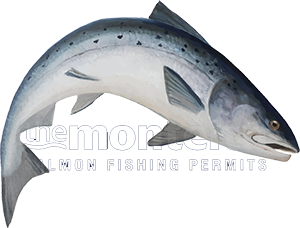 An Atlantic salmon doesn't care who you are and if your presentation or equipment is flawed a salmon will always avoid capture. In periods of naturally ocurring low stock levels you really do need to know your trade intimately to coax a fish into cooperation. The above is definitely part of the attraction of salmon fishing and long may it remain this way as if it were too easy to master there would be little of a challenge. I recall my late mentor Willie Laird on the River Tay advising me that throughout the 1930's there was a very low period when not many salmon appeared in the Tay and the words 'natural cycles' were words he often used when describing River Tay salmon runs. On the back of a pretty poor Autumn run of salmon on the River Tay this year and the complete failure of the fishery board in sanctioning the now necessary Tay fishing season extention to the end of October I have no doubt from experience that these prized Autumn salmon will appear late October through November as I've personally witnessed in recent decades. As a river man the perfect seasonal dates for the Tay these days would be from the 15th of February to the 31st of October and the majority of Tay fishers and guides would agree with this. These dates would allow an easier passage back to the sea for spent kelts which do not survive being caught by salmon fishers in January when they are very vulnerable in the river and weak. This carnage is simply bad form for the rivers valued broodstock and a disgrace to the industry these days which is meant to be all about safeguarding salmon. A later finish on 31st October would mean the Autumn Tay fishers would stand a much better chance of seeing the start of the Autumn run which wasn't seen at all this year nor will it be with the Tay already closed for the year. Take out the self serving views of the Tay fishery board's angler revenue hijack concept and a few disagreeing Tay salmon beat owners from the equation and everything on the Tay is in fine order as always and still of potential huge benefit to Perthshire and its rural economy which needs all the visitor assistance it can get. In this world of climate changes whether engineered by man or naturally ocurring you simply must be flexible and move with the times.